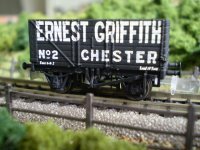 Three of our Ernest Griffith open wagons. A 10-ton wagon load might seem like an awful lot of coal, but back in the pre-war era there were an awful lot of coal fires burning it. When the cold winter winds were blowing down from the Welsh mountains then every home, office and shop in Chester would be putting another shovel or two on the grate, and it wouldn't be long before they'd be needing another sackload from their coal merchant. Business down at the coalyard would have been pretty slack over the summer, but once Jack Frost reported back on duty then sales would start picking up nicely. And the last thing any businessman wants is to be out of stock when the customers call in with their orders, so Ernest Griffith would be making sure he always had plenty of the black stuff sitting in his staithes ready for bagging up and selling on. 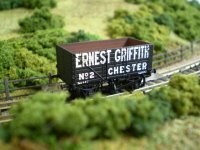 One wagon load would be gone in no time, so he'd be coupling up two or three of his modest fleet and sending them off to the collieries on a regular basis. 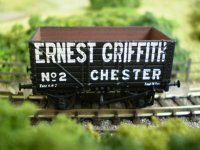 Keep Ernie stocked up on your layout with our Griffith Rake. 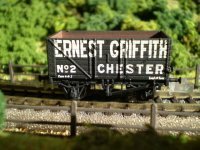 Please note wagons are boxed individually. Loads are not included.